Air bikes are a staple in the Crossfit world and one of the best ways to shred calories. But riding an air bike is the easy part, finding the right one is another story. We evaluated 20+ models, consulted as many consumers, and narrowed down the best air bikes by use case. For a quick look at our top picks, check out the table summary below. For key features, considerations, and in-depth reviews, read on. This is our top pick because of the single belt drive. Most air bikes are chain-driven making them louder and jerkier. The Schwinn Airdyne Pro is smooth, quiet, and virtually indestructible. The Assault AirBike Classic is a staple in the Crossfit world. It was the air bike used at the 2015 Crossfit games in California. Since it’s chain-driven and not belt-driven, we had to rank it behind the Schwinn Airdyne Pro. The Marcy AIR-1 is a bare bones air bike that wins in price. It has everything you need to get a solid workout but it’s not meant for intense training or Crossfit. The AD6 is the predecessor to the Schwinn Airdyne Pro. The maximum weight capacity is 300 lbs. This is what you would expect from the Concept2 brand. Very-well engineered and versatile. If you’re a Crossfitter or want a top-of-the-line air bike to really challenge yourself — this is a great choice. If you’re a serious Crossfitter or looking to lose weight and build muscle — the Assault Bike is a great pick. If you’re a beginner to intermediate fitness level and are looking for a budget-friendly air bike — this is a great pick. If you want a solid air bike for Crossfit or weight loss without the high-end price tag — the Schwinn AD6 is a great choice. This is for you if you prefer a smaller air bike, are okay with no handlebars, and aren’t training for Crossfit. The only real con is the price point. It’s a chain-driven system which requires more maintenance and doesn’t last as long as a belt-drive. It has lots of plastic and isn’t meant for heavy commercial usage. The seat is only 2-way adjustable (up/down) instead of 4-way like the Schwinn Airdyne Pro. Why Buy an Air Bike? Great for HIIT. Air bikes and high-intensity interval training go together like peanut butter and jelly. If you want to build muscle, burn fat, and get shredded, all at the same time, air bikes are a must. Long lasting. Air bikes are one of the oldest pieces of fitness equipment on the planet. The simple design, and lack of fancy features, makes them almost impossible to wear down… even when you’re giving it all you’ve got. Stay cool. 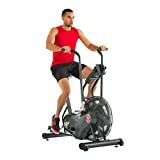 The giant fan on the front of the air bike creates airflow and keeps you cool as you drip sweat, making your workout a little bit more tolerable. There are two types of drive-systems: chain and belt. If you want to cut the noise coming from your air bike, spend the extra money and buy a belt-driven system. If you’re not concerned with the noise-level, by all means buy a chain-drive. Chain-drives, though, require more maintenance because you have to grease them. If you don’t mind being a handyman at times, chain drives are a good choice. Not all air bikes come with displays but a quality display can make your workouts better and easier. It can be the difference between a good and bad workout (and bike). Higher-end air bikes have big screens and a backlit display that are easy to read… even at night. Plus, they are conveniently placed for easy access. (Note: you should always be able to reach your display with ease). Air bikes come with 2-way and 4-way adjustability. The former means the bike seat goes up/down. The latter means it goes up/down/forward/backwards. If you own a commercial gym, and need to accommodate a variety of body sizes, 4-way adjustability is the way to go. Otherwise, if you’re buying an air bike for yourself, 2-way adjustability is fine. The last thing you want to do is tip over mid-interval. But how do you gauge build quality? Well, how does the air bike look and feel? Are the accessories made with cheap and flimsy plastic? Do you feel stable when you pedal or does the bike wobble? Pay attention to the weight of the bike. Heavier bikes tend to be of higher grade materials. Like steel for the frame and hard plastic for the accessories. Most air bikes come partially assembled and can be fully-assembled in under 90-minutes… depending on your handyman skills. Having your own tools makes things easier although most air bikes come with all the tools you need. But sometimes the manufacturer tools aren’t the best quality. You can also pay for professional help if you want. It’s a pretty penny but may be worth it depending on your situation. Ask a friend or family member for some help. At least make sure you have someone there to help you take delivery of the bike. The boxes are big and heavy, and impossible to move alone. There are a few accessories you might want to consider for your air bike. Adding a water bottle holder can go a long way if your bike is missing one. Seat cushions for extra comfort are of great use if you find your seat is too hard. Portable padding is particularly handy if you often ride commercial bikes at the gym. Exercise bike mats can help keep your air bike stable. They’ll help prevent it from rocking and make the ride more comfortable. Plus they can help protect your floors from nasty sweat stains which is always a plus! There are two main warranty types with air bikes: frame and parts. Frame warranties range from 2 years to life. But read the fine print. Some manufacturers make you pay return shipping for servicing which can add up. Parts warranties range from 1 to 5 years. But again, the fine print. Some products have different warranties depending on where it’s purchased. So buying online vs. in-stores may impact the terms of your warranty. Always read the fine print. A word of caution: if you exceed the max. weight capacity of your bike and something breaks—you might not have coverage. Or if you misuse it or make modifications—you could void the warranty. Lastly, you might find a “labor” warranty with some air bikes. This determines whether you have to pay the technician if they have to come to your home to service the machine. You’ll find air bikes cost anywhere from $300 to $1500 depending on the considerations above. Most air bikes in this range are budget picks and aren’t made for long-term heavy usage. These air bikes are for entry-level workouts for beginner fitness levels. As you go up in price, the build quality gets much better and you start to find air bikes that can handle heavy training. If you’re a serious Crossfitter or own a commercial gym, these bikes are closer to what you want but not quite there. This is where you start to see some real Crossfit bikes. Like the Assault Air Bike and the Schwinn AD Pro (both of which are in our top 5 picks). Most air bikes at this level will last you a lifetime if properly cared for. If you plan on riding your air bike for a long time, this is where you want to be. Schwinn is one of the most recognizable fitness brands in the world. They make several popular air bikes like the Schwinn AD2, Schwinn AD6, Schwinn AD7, and Schwinn AD Pro. Marcy has been making fitness equipment since 1982. Although not as recognizable as Schwinn, they still carry their weight in air bikes. Their most popular air bikes are the Marcy AIR-1, Marcy ME-708, and Marcy ME-709. Stamina has been making fitness equipment since 1987 in all categories. Their most popular air bikes are the Stamina ATS and Stamina Airgometer. Sunny Health & Fitness has been in the space since 2002 and are a manufacturing powerhouse. Their most popular air bikes are the Sunny Health SF-B1203 and the Sunny Health SF-B2618. Assault Fitness (LifeCore) caters to elite athletes. They’ve been making fitness equipment since the late 1990s. Their flagship products—the Assault Bike Classic and Assault Bike Elite—are 2 of the best air bikes on the market today. The Schwinn Airdyne Pro is our top pick because of the single belt drive. Most exercise bikes are chain-driven which make them loud, jerky, and harder to maintain. Belt-driven systems are smoother/quieter, more responsive, last twice as long, and don’t rust. The build quality is great. The plastic used around the bike on the frame and footpegs is hard/solid. And the multi-grip handlebars are hard/quality rubber. Max weight capacity is 350 lbs which is higher than most air bikes and speaks to its durability. The digital display is big, easy to read, and more intuitive than most other displays. You can track calories, watts, time, distance, speed, RPM, and heart rate. Plus, you have the option to choose from several different built-in workout programs based on calories, time, and/or intervals. Assembly is easy and it comes with a giant water bottle holder, a slot for your phone, and a padded seat for extra comfort. This bike is expensive but it’s a good example of “you get what you pay for” in the air bike world. The Marcy AIR-1 is our budget pick because of the significant cost savings. Keep in mind, though, that it’s not in the same class as the other air bikes on this list. This bike is nowhere near as durable and can’t handle heavy usage. If you do Crossfit and want a budget-friendly air bike, this isn’t the bike for you. You’re better off going with the Xebex Airmill (see below). The Marcy AIR-1 is for moderate workout intensity and physical therapy. If you want a bare bones exercise bike for home, enough for a few workouts per week, the Marcy AIR-1 is a great pick. It measures 45 x 25 x 48 inches and weighs 79 pounds, and comes with a 2-year warranty. It has transport wheels, a high-density foam seat, and foam-covered handlebars for added comfort. The LCD screen displays time, speed, distance, and calories. The Assault AirBike is one of the most popular air bikes for Crossfit. In fact, the Assault bike was the air bike of choice for the 2015 Crossfit Games in Carson, CA. The Assault AirBike was the best air bike around before the Schwinn Airdyne Pro and the Assault AirBike Elite. The bike is simple, solid, and has everything you need for a good workout. Plus, it’s cheaper than the air bikes listed above. There are several built-in workout programs including intervals and goal-based programs. You can even pair a heart rate monitor if you please (Polar brand only). The Assault AirBike Classic is a great choice if you want to save a few bucks and still get a mean workout in. The Schwinn AD6 came before the Schwinn AD Pro. It shares the belt-drive in common so you still get a smooth and quiet ride. The seat isn’t as comfortable and it only moves 2-way (up/down) versus 4-ways like the AD Pro. And the display is less intuitive and harder to read. Max weight capacity is 300 lbs compared to the AD Pro and Assault bike at 350 lbs. The AD6 is a great pick if you want a high-end feel without the high-end price tag. What you lose in features, you make up for in price. The Concept2 BikeErg is a non-traditional air bike as you can see at first glance. All Concept2 products have great engineering (like their rowing machines). The BikeErg is no different. The biggest advantages to the Concept2 BikeErg is its versatility. Translation: you don’t have to do intervals every time. You can experiment with a variety of workouts. Plus, the display is big and easy to read which makes riding more convenient. You can adjust the seat and handlebars 2-ways which makes it accomodating for a variety of body types. The aluminum frame is lightweight and durable (58 lbs) which makes it easy to maneuver and store. The biggest drawback is the lack of accessories. There’s no water bottle holder or phone “cradle” by default—you have to pay extra for those. If you prefer a lighter frame and don’t care for handlebars, the Concept2 BikeErg is a great choice. Though the Assault AirBike Elite is the most expensive on our list, it’s not our favorite. Why? Because it’s not belt-driven. It’s a dual-chain drive which is smoother and more responsive than a single chain drive like the Assault AirBike Classic… but chain-driven nonetheless. That said, the Assault AirBike Elite is still a great bike and has improved on the Assault Classic… but our top pick is still the Schwinn Airdyne Pro. The styling and safety has improved between the 2 models (Assault Bike Classic vs Elite). The Assault Bike Elite has plastic covering (shrouding) around the chain drive which looks a lot cleaner. Plus, it has bigger, more comfortable, sweat proof seats. The LCD display is also bigger and easier to read which makes for a more convenient workout. The pre-programmed workouts are great because they keep workouts engaging. It’s like having your own personal trainer. Like the Schwinn Airdyne Pro, you can choose from goal-based workouts (calorie, heart rate, time, distance) and intervals. The Xebex Airmill by Get RXd is quite comparable to the Assault Air Bike (Classic) above. It’s one of the sturdiest air bikes around due to the heavy frame and high-quality components (nuts and bolts). Definitely an upgrade from the older Schwinn Airdynes and Assault Bike. Solid and well-built air bikes like the Xebex Airmill ensure a smooth ride. Lesser quality bikes often shake, rock side-to-side, and make you work harder to channel your energy in one direction. This bike has a strong build and is easier to move (and store) than older air bikes. The transport wheels attach to the stabilizer bar and directly to the fan. There are some cheaper plastic accessories on the bike that could use an upgrade. But aside from that it’s pretty solid. The Xebex Airmill is like its predecessor, the Xebex Air Bike, but costs less and comes with better handlebars. Also, you can adjust the seat 4-ways (up, down, forward, backward) which is great if you need to accommodate a variety of body types. These are the other bikes we considered but did not make our top 5 choices. Xebex Air Bike: This used to be the best bang for your buck before the Xebex Airmill. Now you can get the Airmill for cheaper which is more or less the same bike with better handlebars. StairMaster Air Fit Bike: Solid build with everything you need (and more) but expensive and not better than the Schwinn AD Pro. Sole Fitness SB800 Air Bike: 40 lbs heavier than the Schwinn AD Pro and more expensive. If you prefer Sole and want to spend the extra money — by all means. Stamina Airgometer Upright Bike: Not worth buying new. There are better options available—like the Airmill by Xebex—at a slightly higher cost. Buying used might be worth it though. Schwinn AD4: No longer available. This bike had too many problems. Not even worth buying used because replacement parts are no longer available… so if something happened it would be tough to fix. Schwinn AD2: One of Schwinn’s oldest models and no longer worth discussing. Too outdated. The marketing tagline sums it up nicely: “simple and affordable”. Marcy NS-1000: Step down from the Marcy AIR-1 for half the price. Not a great bike for heavy use. Body Rider BRF700 Fan Bike: One of the cheapest air bikes around. Everything is basic and not equipped to handle heavy use. Not recommended. Sunny Health & Fitness SF-B2706: This bike is around the same price as the AD6 and lesser quality. Not worth buying unless you find a good deal on a used one. Body-Solid Endurance FB300 Fan Bike: Like the Assault AirBike (Classic) with a higher price point. Not worth it. Q: How many calories can you burn on an air bike? A: Since air bikes have infinite levels of resistance, and built for high-intensity workouts, it’s easy to burn lots of calories. But everyone’s different. The best we can do is tell you that the most calories burned on an air bike—ever—is 66 in 60-seconds. This record was set by Jake Baker in May of 2015. Suzan Surman set the women’s record the same day burning 37 calories in 60-seconds. Q: How do you do HIIT on an air bike? A: HIIT or high-intensity interval training is one of the best workouts you can do for weight loss. And guess what? It’s even better on an air bike. This guy breaks it down nicely. For a complete breakdown of HIIT, the different types, and all the benefits, check out our HIIT training guide. Q: How often can you train on an air bike? A: The most important thing to remember is to listen to your body. What works for you might not work for someone else. Start with 1-2 times per week, see how you feel, make sure to stretch and foam roll, and go from there. Q: Can you get abs from riding an air bike? A: Abs are primarily made in the kitchen but air bikes can definitely help them pop. If you do HIIT and actively engage your core on your air bike, you can certainly pick up some definition. Caloriebee does a great job breaking down this topic. Q: What’s an Assault bike? A: The Assault Bike is one of the most popular air bikes in the Crossfit community. It was the air bike used in the 2015 Crossfit games and is comparable to the Xebex Airmill. Assault Fitness released the upgraded Assault AirBike Elite in 2018. Air bikes can help whip you into shape in no time. Whether it be for an upcoming event or because, well, beach season. Regardless of use case, finding the best air bike is a matter of narrowing down your options. What do you want out of your air bike? Which features are most important? How much are you willing to spend? We hope the above recommendations and considerations have been helpful. Now, let’s turn it over to you. Which air bike are you thinking of buying? Which one do you recommend? Let us know in the comments below!